Dr. Klym wants you to have a smile you’ll really feel good about. That’s why we feature Invisalign®, the revolutionary way to straighten your smile without metal braces. The Invisalign process begins with your consultation with Dr. Klym. We’ll perform a dental examination, and Dr. Klym will ask you some questions about your smile goals. That way, he can recommend the option that’s right for you. If you decide to go with Invisalign, we can get the process started right away. We’ll use our advanced 3D imaging equipment to make a digital impression of your smile. Then we share this information with Invisalign so they can create your custom aligners. Invisalign aligners are made using our unique SmartTrack material. Every two weeks, you’ll receive a new aligner that’s custom made for you, gradually guiding your smile to the perfect position. You can continue to eat all your favorite foods with Invisalign because you simply remove your aligners when it’s time for a meal. Dr. Brian Klym is one of the leading Invisalign providers in Northwest Michigan. In fact, he’s fixed so many smiles with this treatment that Invisalign recognizes him as a Preferred Provider. Call today to find out more about our Invisalign care and see what we can do for your smile. Here’s some additional information about Invisalign to help you make your decision. 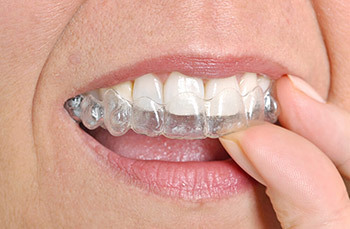 Invisalign is an innovative way to straighten your smile without metal braces. Instead, our clear thermoplastic Invisalign aligners gradually reposition your teeth, giving you a perfect smile. Our exclusive SmartTrack material was specifically engineered for the Invisalign process. Each of your custom aligners is made just for you to ensure comfort, reliability, and a great fit. When you consider all the advantages, there’s really no comparison between Invisalign and the competition, whether you look at metal braces or other types of aligners. Invisalign is an excellent option for your teen. In addition to taking about half as long to straighten your teeth as metal braces, Invisalign trays are also much more convenient. For example, Invisalign requires a lot fewer office visits, leaving you and your teen with more time to spend doing the things you really enjoy. And the trays are invisible, so friends probably won’t even notice them. This is important because many teens are self-conscious about their appearance.